All they wanted was the vote. However, at the beginning of the 20th century and after fifty years of peaceful protest, Britain's suffragette movement was no closer to achieving this aim. Desperate and frustrated, factions within the movement decided the time had come for civil disobedience. Suffragette tells the story of one group of women who are willing to risk everything to stand up and fight for their rights - and ours. Suffragette is a shocking, gritty film about a shameful chapter in British history. Often brutal and at times a tough watch, the film is both gripping and involving. 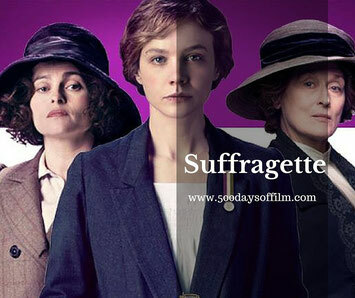 However, don’t watch this film thinking it's Downton does the Suffragettes. Don’t watch this film expecting a feel good, girl power romp. But do watch this film… it’s important. 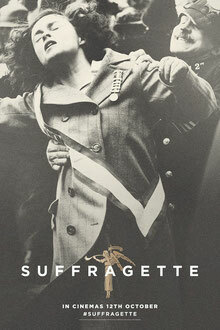 Suffragette is the first film about the British Suffragette movement. Can you believe that? It feels incredible to me and I can’t begin to imagine how much pressure the film’s director, Sarah Gavron, and screenwriter, Abi Morgan, must have been under to do justice to this story. However, both women have been criticised for not doing enough with their film. Suffragette should have been more edgy and not so straightforward in its storytelling. They should have included the plight of other minority groups. Their depiction of men is too simplistic. They should have alluded to the conflict within the movement regarding the use of violence. Such criticism is, I think, deeply unfair. This is one film about one group of suffragettes at one moment in time. It does not claim to be the only story. It does not pretend to be the last word. Indeed, the film’s contemporary tone opens the door (I hope) for many more films about the fight for gender equality. 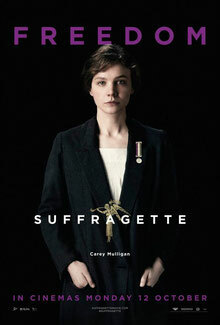 Suffragette’s story is told through the eyes of Maud, brilliantly played by Carey Mulligan. Maud is not real. She is a composite character, a creature of fiction, based on the huge amount of research conducted by Gavron and Morgan. Maud is a working class London wife and mother of a young son (beautifully played by Adam Michael Dodd). She works long, long hours in a laundry (in quite awful conditions) and has done so since she was twelve. One day, Maud finds herself caught up in violence. 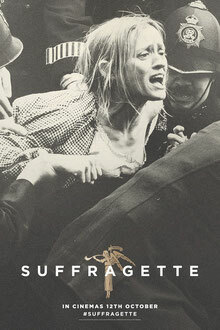 In the fray, she sees a women, Violet Miller (brilliantly portrayed by Anne-Marie Duff), hurling rocks into shop windows. Shocked and frightened, Maud flees the scene but her interest in the Suffragette movement is peaked nonetheless. When Violet starts to work at the laundry, the two women sense a common bond. Maud agrees to support Violet on her trip Westminster where she is to give her testimony to David Lloyd George (in the hope that he will amend the law and give women the right to vote). When Violet is unable to give her testimony, Maud takes her place and believes, for a moment, that she has been heard. Lloyd George later announces that the law will not be changed. Maud feels betrayed and this cements her desire for change. However, this desire will cost Maud dear. She will be pushed to the edge, she will suffer incredible police brutality, she will be arrested, incarcerated and she will be force fed. She will risk everything. To keep going, Maud draws on the energy of the inspirational women around her. For example, local chemist, Edith Ellyn, organises suffragette meetings and militant campaigns. 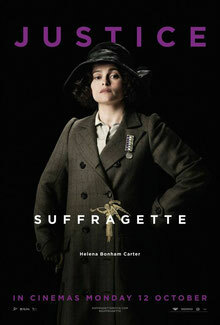 Helena Bonham-Carter is superb as Edith - her charismatic performance is scene stealing. This was a character that I wanted to know more about. 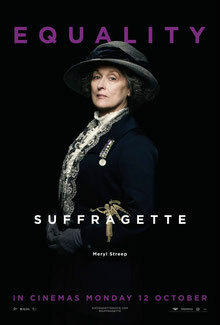 Meanwhile, Meryl Streep plays Mrs Pankhurst. This is a fleeting (mere minutes), yet crucial role. Abi Morgan has talked about how important it was for the film to show how Mrs Pankhurst was both hugely charismatic and inspirational. Sadly, for me, the film failed in this area. I didn’t feel moved or inspired by Streep’s Pankhurst. This is nothing to do with the performance itself. The movie just doesn't seem to have enough time to devote to her inspirational speeches. Take a look at the video below to get a sense of Pankhurst at her best. After taking its time to develop Maud’s story, the final act of Suffragette picks up the pace. Maud travels to Epsom with fellow suffragette, Emily Wilding Davison. Their aim is to attract the attention of the King. They do so, but not in the way either would have expected or wanted. Having lived in Epsom all of my life, I am well acquainted with Davison’s story. It was no less shocking to watch. The final part of Suffragette includes moving, real life footage of Davison’s funeral procession. This felt incredibly moving. Suffragette’s challenging tone continues to the very end. At no stage did I think that this film was going to finish with a happy ending - or an ending of any sort. Gender equality is still very much a work in progress and, in honour of those women who sacrificed so much, the film reminds us that we must never give up the fight. The casting of Meryl Streep as Mrs Pankhurst was key in getting Suffragette financed. The publicity campaign for Suffragette ran into controversy when Streep, Duff, Mulligan and Garai were photographed wearing t-shirts with the Emmeline Pankhurst quote “I’d rather be a rebel than a slave” on the front. Some people claimed that this quote was offensive because it ignored the historical implications of the word slave, particularly in the context of the t-shirts being worn by four privileged white women. Suffragette opened the 2015 London Film Festival. 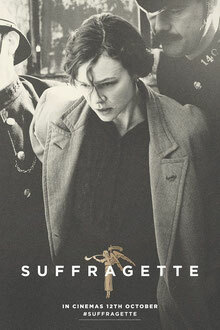 Have you watched Suffragette? If so, what did you think of this film? I'd love to know your thoughts in the comments box below.